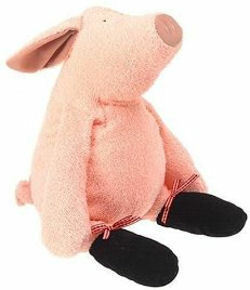 We have a mailing list of folks looking for the large and small version of this TipToes pig. Our 17 month old is sooo attached to his little pig – Pierre from the Manhattan Toy Co. with black feet and beans in the hands and feet etc. Seems like a lot of kids love this toy. I’m having a hard time finding a replacement for our very worn and close to worn out pig. Can you help? 370199190302 Ebay make an offer. Thanks! I've passed the link along.